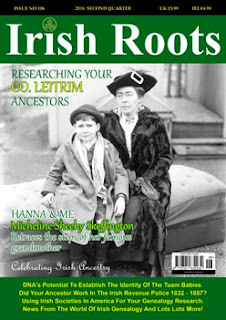 The Summer edition of Irish Roots – Ireland's only independent genealogy magazine – has been published. And Another Thing: Genealogical comment and observations with Steven Smyrl. Your Genealogy Questions Answered, Letters To The Editor, and lots more! You can discover more about this long-established and respected publication by clicking the image of the front cover, above. There's even a free sample to download!